How do you respond to the demands of your water network? On average, every third liter of water produced worldwide is lost somewhere in distribution; a waste of a vital resource, and of the amount of energy consumed and hard work invested in its production. Water services are challenged by aspects such as growth in population, increased water demands and restrictions on energy consumption. Any reduction of water losses will therefore help avert water shortage, free resources and indirectly reduce the consumption of energy – creating benefits for the network, its end-users and for the environment altogether. Reducing water losses would require vast insight into what is actually going on within the distribution network. Where exactly is water lost? How to manage? Where to set in first? – a comprehensive task, as some networks cover massive areas, sometimes transporting water hundreds of kilometres before it reaches its customer. Trying to manage processes here would be time-consuming, offering delayed information and extended reaction spans. Therefore, dividing the network into smaller sections (district metered areas, or DMAs) is an ideal strategy for obtaining an overview of the total network activities, making it possible to start thinking in smart, advanced ways of managing network processes. By adding a timer and two operating pilots, an AVK pressure reducing valve is able to handle the varying needs, thus lowering the pressure in off-peak hours to a pre-defined low. This way it is possible to make operational adjustments based on collected network data – a process which can be further optimized through response to real-time demand, using a smart, solenoid solution. An AVK intelligent control valve is a pressure reducing valve with an added controller. It has the ability to receive data from a number of inputs and can operate itself accordingly based on inputs of flow, pressure, network losses, temperature, open/close position and maintenance requirements. 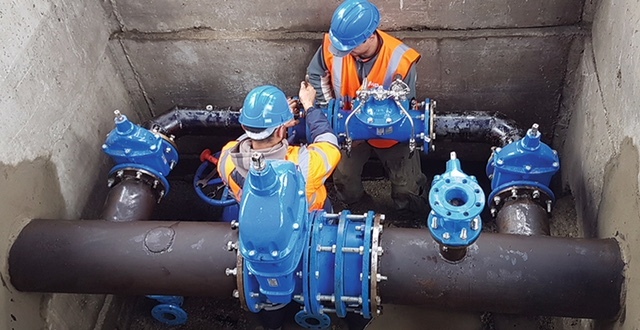 It contributes to a smart water network by providing optimized network pressures, reacting to system failures, reducing leakage, and by giving feedback on valve position, water temperature, quality and valve maintenance status. The entire system will then be responsive to real-time data, offering you the advantages of a smart water network; an integrated set of products, solutions and systems that enables you to remotely and continuously monitor and diagnose problems, prioritize and manage maintenance issues and use data to optimize all aspects of the water distribution network – not only saving resources and efforts, but also ensuring an overall improvement of network performance.